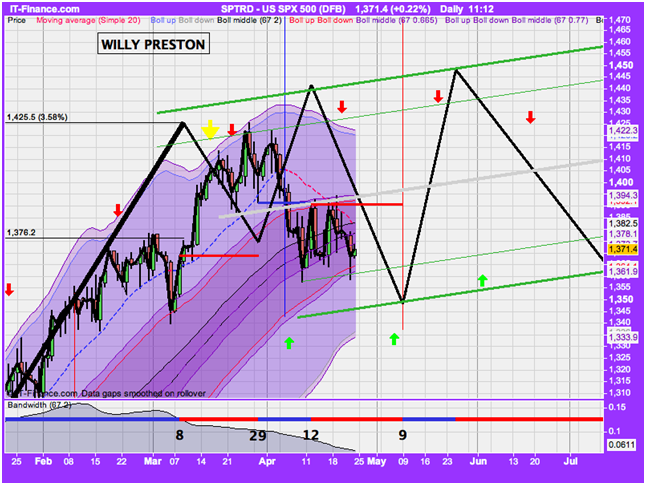 Here is Will Preston’s updated SP500 model chart. Apple jumped 7% in afterhours last night, so looks likely to be bullish for the markets today, now let’s see what the FOMC outputs are and how they are received. Sunspots continue to climb, but geomagnetic disturbances continue. Dutch CDSs are at joint record highs, following the fall of their government, joining Spain debt in reaching accute again. Yet the Euro is edging up against the dollar despite these troubles. This model looks exactly inverted……Is that the point? Over to Will to answer that. Sorry I haven’t commented earlier I’ve been caught up buying some Gold on that dip and then following the FOMC. I take your point as it does look like it has done so recently. The target of the up drive from 23rd Nov was 1425. On the 8th March. The top was 1425 so I think that that stands up. The gradient of the rising channel seems to be accurate so far as can be seen by the fact that it has bounced off the projected 1sd. I think it will be most interesting to re evaluate on the 9th May – at the next modeled inflection point. The other point is that I believe, and this is demonstrated by the model,that this is a much more subtle move this summer than last one was so I believe the channel size and gradient are probably more important. Dealing points will be thrown up using the normal indicators that JH and we all use. I will show you last year’s model tomorrow again and you will see how overall it fitted well but at times there appeared to be a major dislocation which in fact was where all the big opportunities were. Will I think you have nailed the bottom there. I bought some Silver about $30 as it tested that major support level too. Moving onto S&P 500, does anything think that 2012 could actually send us much much higher into 1,500 or even 1,550 resistance? With some many traders expecting “Sell In May And Go Away” like in 2010 and 2011, from a contrarian point of view, how about the notion that stocks surprise us all on the upside? Breadth within the market itself is not flagging any major warnings and cyclical sectors are still doing well enough to give a green light for this rally to be alive. Environment for stocks in terms of (1) inflation rate (2) bond yields versus stock yields (3) interest rates (4) yield curve (5) stocks valuations (6) investor sentiment (6) money supply – is all pretty positive. It currently appears that Sp500 equities have successfully backtested their 2011 highs so could be primed to move higher. Juan by mail states that Doug Kass has now gone bullish, thinks the correction has ended and that into the elections is historically positive. On the flip side, economic surprises for the US alone have now gone negative and for major economies continue to decline. We need to see a turn around in this, either central bank assisted or naturally. Into the solar peak is typically growthflationary, so I expect they will turn up one way or the other, but no sign yet. Sunspots are up, which should encourage commodities speculation again. Pessimism abounds in silver (thanks Tiho), wheat, cocoa and coffee, which is contrarian bullish. Gold made two hammer candles at support, gold miners have broken out of a down sloping wedge. Bernanke kept the door open to additional stimulus in his press conference yesterday, which is likely to support pro-risk. But geomagnetic disturbance persists. Looks like the dollar is breaking down out of its triangle. But await that to be confirmed the next few days. Thanks. If you mean does he have a blog, I think the answer is not yet.